The sport of white water river rafting calls for a triumph over the swift swirling river as it gushes past spectacular mountains. It is practiced mainly in the upper reaches where the water is wild and white as it froths and foams, crashing against narrow gorges, rocky outcrops and falls at deep gradients. Sandy beaches line the river at intervals, allowing river rafters to pull up alongside. The slopes on either side are covered with oak, pine spruce and fir, with the occasional village and its terraced fields dotting the landscape. Wild-Life can be sighted at a distance, especially spotted deer, monkeys, leopard, while multi-hued butterflies flit among flowering bushes. Spiritual retreats and ashrams overlook the river and add to the spiritual experience. Suitable and best season for rafting is October to June. 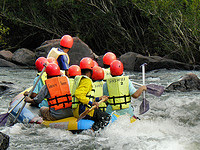 The equipment for white water river rafting is an oar frame raft which usually accommodates a maximum of eight persons. It is navigated by an experienced guide using two large oars. Sometimes all persons on board use paddle for greater power to match the river. However keen coordination is necessary and it is important not to fight the currunt if adrift. Minimum age for participation is 14 years, younger children are allowed on certain sections of the rivers with safety being the priority. Class 1 : Easy; moving water, small waves, on obstacles. Class 2 : Moderate difficulty, with clear passage. Class 3 : Difficult, high irregular waves, narrow clear passage, require Precise manoeuring. Class 4 : Very difficult long rapid, powerful irregular waves and Hydraulics, require precise manoeuvring. Class 5 : Extremely difficult, long violent and highly congested rapid, For team of experts only. N.B. 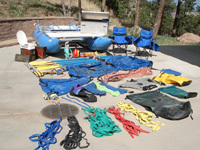 : We encourage safe adventure under the special attention of trained and professional staff. Skylark Journeys does not take any responsibility for any mishap or accident that might occur.